Thank you for going to rescue the seal, booni. I sure hope that it will survive and recover well. So many people are involved to make this work. You're making it possible for them to be able to help do the right thing, too. Thank you and that lady so much booni! Hope the little one makes it. Grrrrrrr to the people that insist on fighting about these things. Thank you Booni xo and also a big thank you to the lady and her son who knew the poor pup was in trouble. Well done... now hopefully things will work out for the little guy. A happy update on the Lunar Rock eaglet is posted HERE. An eagle rescue, so late in the season! Eagle found in the water near Heron Rocks... See the story here. This morning i got a call about a Raven that needed help. The Raven had been found lying on the road! Someone was just moving the Raven off the road when someone else pulled over to help. He ended up taking the Raven to a nearby property where the owner provided a cage with a towel in the bottom. i went over there with one of our small dog kennels & transferred the Raven over to it. i hadn*t been able to find the man there, & i*d seen the wire cages, but didn*t see the Raven until i parked & walked around looking. The poor Raven was so low that he was pretty much just a puddle in the bottom of the cage. No wonder i didn*t see him. Eyes were open, wing was moving weakly against the cage. i drove down to the ferry lineup & the second person i asked turned out to be Art Martell, a Vancouver Island retired wildlife research scientist who had just given a talk at the Hornby Natural History Center two weeks ago. He was going to take the Raven right up to Courtenay & then call MARS. What luck Booni... the raven sounds like it is in bad shape... hope it makes it. Thank you Booni! So glad that you were able to respond and all fell into place so that the raven could be seen by Mars. Yesterday evening, i got a call from The Cardboard House Bakery that some girls had found a little Bird on the road that had been hit by a car. One of them thought the wing was broken. 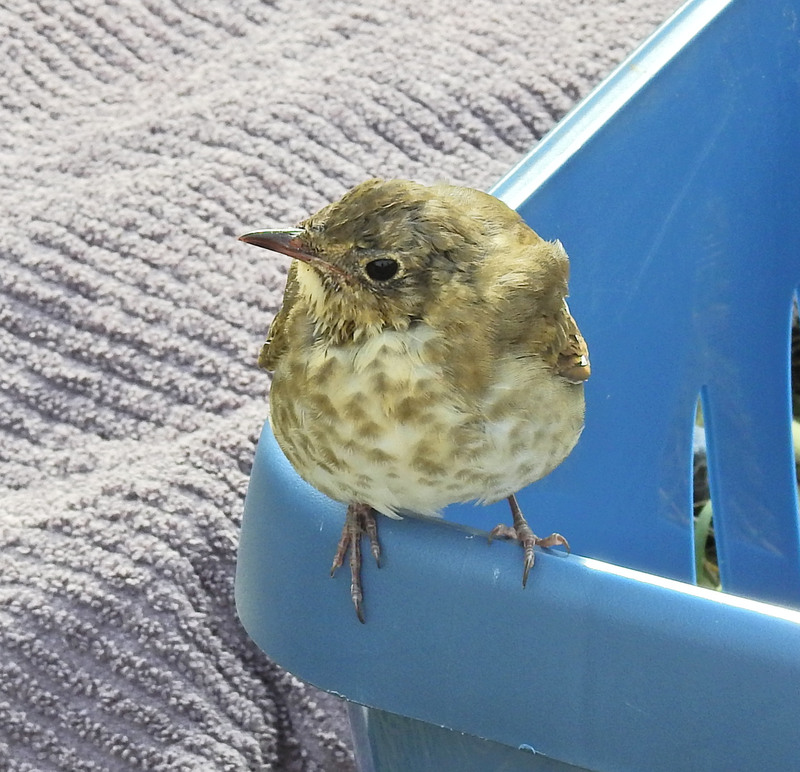 The Bird was getting blown around by the cars whizzing past, so the girls set him in a towel beside the road. i went down there with my small kennel & they showed me where they*d left him. i picked him up & put him in the kennel & covered it with a towel & told the girls i was going to bring him home & let him rest for a bit. i put the kennel in a quiet room & left the cover on. i could see through the slats of the kennel & the Bird had moved to a corner & lay down with their eyes closed. Every time i checked, there was no change. The eye was closed & the Bird hadn*t moved. i was sure he was dead. i didn*t want to lift the cover & startle him, & it was dark now, so i just left the kennel quiet for the night. This morning there was a loud, strange Bird call that Otto & i thought was outside, but i didn*t connect the dots. i was sure the Bird was dead. So, i carried the kennel outside & took off the towel cover & there was the Bird looking at me & there were four purple poops on the liner towel! 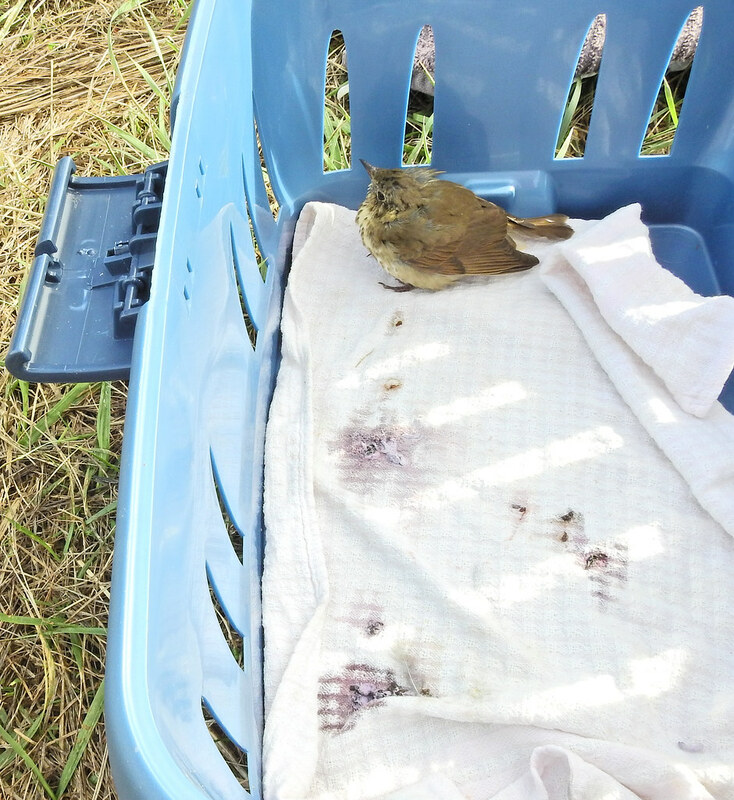 Well, i thought the best thing for the little Bird would be to let him free near where i found him so that he could eat & get better. So, down we went to the Bakery. i set the kennel down on the grass in the parking lot & opened the lid. The Bird just stayed in the kennel in the corner. Here he is with his purple poops. i thought, uh-oh, now what. So i put my hand in to see what the reaction would be & he fleaped up to the rim of the kennel & perched there, looking around & looking at me! So i walked around taking fotos & a video to help i.d. the Bird, also for assessment & he remained perched on the rim. 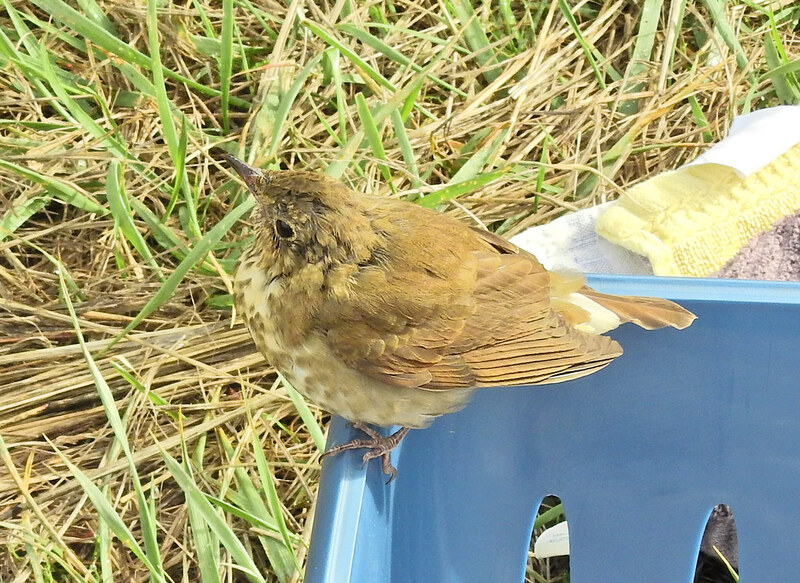 i think this might be a Swainson*s Thrush! A Bird you hear a lot, but almost never see. When i decided to move to the sun side of him, that was enough, & he took off & flew into the forest!